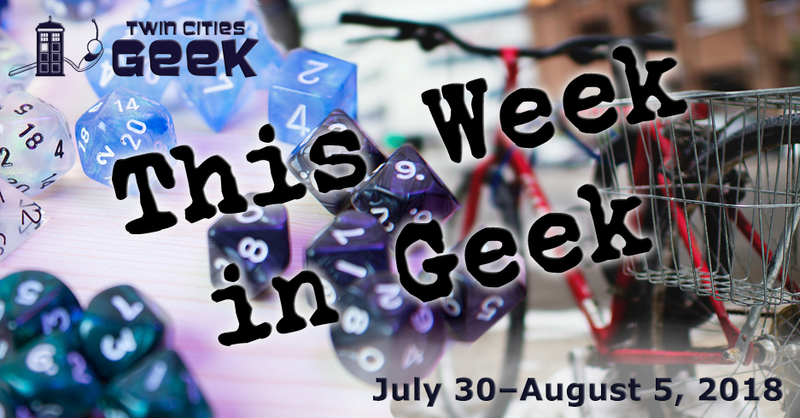 Welcome to This Week in Geek, your guide to events of interest to the Minnesota geek community for the week of Monday, July 30th to Sunday, August 5th. When: Monday, July 30th at 6:30 p.m.
Let your creativity shine with drawing, painting, crafting, or whatever your heart desires at Creative Night, a weekly event put on by Crafty Geek and the Geek Partnership Society. This is a free event, so bring some of your own stuff to work on, bring some snacks, and hang out in a collaborative space. When: Tuesday, July 31st at 11:00 a.m. to 8:00 p.m. Celebrate the Boy Who Lived on his birthday by getting a Harry Potter tattoo from Minneapolis Tattoo Shop. This will be a walk-in and first come, first served event, and the available designs are posted on the event page. When: Tuesday, July 31st at 7:00 p.m. Enjoy a night of community and tea with Tea and Meeples, a weekly gathering of friendly geeks at Panda Castle in Richfield. This week, the group will get together for a night of board gaming, with a salad bar for dinner. Do you know a horcrux from a bezoar? Test your knowledge of all things Harry Potter with some trivia on the Boy Who Lived’s birthday itself! Teams of up to eight people are allowed to compete for wizarding glory. Enjoy a firkin of Unrated Rye IPA made with ghost peppers called “Goblet of Fire,” brewed specially for this night, as well as English food from Potter’s Pasties. Costumes are encouraged, and there will be a prize for the best dressed team. When: Tuesday, July 31st at 7:30 p.m.
Come and experience YogaQuest, a blend of yoga and fanfiction storytelling led by certified yoga instructors. Experience a yoga workout experience and a story at the same time. The theme for this week is Harry Potter, so come for a night of magical yoga (muggles welcome). This event costs $15. When: Thursday, August 2nd at 12:00 p.m. to Saturday, August 4th at 11:30 p.m.
Set your phasers to fun! The Galactic Get Down is a three-day, outer-space-themed music and camping festival located in the outskirts of Houston, MN. Come check out the wide range of music, including rock, funk, bluegrass, jam, ska, indie, hip-hop, and electronic acts, as well as food and arts and craft vendors. This is a family-friendly event, and see their site for music line ups and ticket pricing. Circus Juventas returns for a summer show with Steam, a show in which the contemporary circus arts tell a steampunk tale! In this story, H.G. Wells and Jules Verne embark on a time-traveling adventure told through the spectacle of the circus. See sky pirates, morlocks, Captain Nemo, and more. Tickets range from $18.50 for children and seniors to $45 dollars for a VIP box, with a variety of packages available. This show will continue through August 12th. The Minnesota Fringe Festival is 11 days packed with plays—all 60 minutes or less—held at a variety of spaces throughout the Twin Cities. The variety of great shows from local performers and writers means you should be able to find something to scratch your geeky itch. This year’s inventive offerings include The Flashlight Zone: 20 Science Fiction Plays in One Hour, Medusa, A Justice League of Their Own, Geminae, What To Do In Case of Dinosaur Attack, and many, many more. Check out the full listing of shows, or view by schedule. When: Thursday, August 2nd at 7:00 p.m. This regular event at Clockwerks Brewing—hosted by Sam Spadino and Sidney Oxborough—represents the convergence of two geeky favorites: a steampunk-themed bar and absurd trivia. Trivia Against Humanity has also expanded and now has weekly events at Mortimer’s and Glam Doll on Tuesdays and Modist Brewing Company on Wednesdays. See the Trivia Against Humanity Facebook page for additional events. One-Shot Comics, a monthly comic series devoted to covering a diverse range of comics and graphic novels, returns with a discussion of Cece Bell’s El Deafo, a comic memoir about the experience of growing up with hearing loss. The Newberry award-winning El Deafo focuses on the Phonic Ear, a device that allows the writer to hear, but has also isolated her. One-Shot Comics strives toward the goals of “creating an inclusive space” and “perpetual awesomeness.” As usual, you can pick up a copy for 20% off at Moon Palace Books. When: Thursday, August 2nd at 8:30 p.m. Enjoy a warm summer night in Minneapolis with cinema under the stars! Movies begin at sunset and are free and open to the public. Bringing a blanket or chair is recommended. Come see Marvel’s critically acclaimed Black Panther, a superhero epic touching on themes of Afrofuturism, isolationism, royalty, and responsibility. Check out the complete schedule of screenings this week. When: Friday, August 3rd at 10:00 a.m. to Sunday, August 5th at 4:00 p.m. Celebrate all things gaming with 2D Con, an inclusive and charitable gaming event held every summer to celebrate the gaming community at large. This convention features a wide variety of games, including tabletop role-playing games, trading-card games, speedrunning, cosplay, retro games, musical performances, industry events, and more. This year’s theme is Critical Hit, so may all your rolls at this con be 20s. Standard preorder badges are currently $35, but there are a variety of other cost options. See the website for more details on registration and the schedule of events. When: Friday, August 3rd at 2:00 p.m. to Sunday, August 5th at 5:00 p.m.
Come together with other fans of comics, collectibles, and pop culture for Minnesota Fan Fusion, an event focusing on showcasing local artists while also bringing in exciting national talent! Find insights into your specific fandoms from great presenters, meet creators who inspire you, and find that special something you’ve been looking for in the exhibition hall. Special guests will include Dan Fogler, Danielle Panabaker, John Rhys-Davies, Laurie Holden, Ray Park, Summer Glau, and many local creators, and Twin Cities Geek will also be on site, so come say hi! Registration runs from $12 for a day pass on Friday to $40 for a full-event membership, or $150 for VIP access, with special added costs for photo ops and autographs with special guests. When: Friday, August 3rd at 6:00 p.m.
Mischief Toy Store in St. Paul invites you to experience some Magic with them this Friday night for the Magic: The Gathering draft event. Entry is $15, and all players will receive prizes, including a “fancy promo card.” This weekly event is limited to 24 players and typically lasts until about 9:00 p.m. All skill levels are welcome. When: Friday, August 3rd at 9:00 p.m. Enjoy an evening of community and movie magic under the stars! Movies start at dusk and are free and open to the public. Screening this week is 2010’s The Karate Kid, with Jaden Smith and Jackie Chan updating the ’80s classic for a new era. Also be sure to check the complete schedule of Saint Paul Movies in the Parks for other films. When: Friday, August 3rd and Saturday, August 4th at 11:30 p.m. The Riverview Theater, a neighborhood theater known for affordable second-run cinema, will be continuing its summer late-night programming series with The Princess Bride, the beloved cult classic about true love (and other mushy stuff), battles of wits over poison, daring, and so much more. All tickets are $3, and the theater only takes cash. When: Saturday, August 4th at 10:00 a.m.
Come check out the exciting launch of a brand new technology conference, one of the largest ever held in north Minneapolis. Expect presentations from some of the most brilliant technology experts the area has to offer, with a special focus on showcasing the tech contributions made by people of color. In addition to the technology presentations, attendees can expect to enjoy musical performances, DJ sets, and food and refreshments. Tickets to this event are $10. The Geek Partnership Society’s United Geeks of Gaming group offers its Open Gaming session on the first Saturday of every month, to which gamers of all ages and abilities are invited in order to “spend the day hanging out with fellow geeks playing, learning, and teaching games.” Attendees are encouraged to bring their favorite board games, card games, and/or role-playing games, but the groups has amassed an impressive library of its own games as well. When: Sunday, August 5th at 10:00 a.m.
Continue celebrating the birthday of the Boy Who Lived with a visit to Amparo’s Wand Shoppe at Sixth Chamber Used Books! This event seeks to replicate the experience of testing wizards and witches for wand compatibility from the Harry Potter series, and Abraham Amparo himself will be present to help with the experience. This event is free and family oriented. This class incorporates a variety of dance styles, including tribal fusion, Greek, American Egyptian, and world fusion and is taught by instructor Shannon (whom readers might know from Geek Slink Belly Dance). These weekly classes will help build a strong core and set of skills. This class is intended for all bodies, all ages, all sizes, and is built on a platform of acceptance and inclusivity. Cost is $15. When: Sunday, August 5th at 12:00 p.m. When: Sunday, August 5th at 12:30 p.m. Gender Jam—a meetup group for trans, gender-nonconforming, questioning, and intersex youth—will be meeting up for an afternoon of community and fun. This week, Gender Jam will be meeting at The Exchange for an art day! Get creative with canvasses, oil and acrylic paints, pastels, and a variety of other materials. As always, bring your permission slip if you are under 18. When: Sunday, August 5th at 5:00 p.m.
Where: St. Croix Boat & Packet Co.
Set sail with a rowdy pirate crew for a day of adventure on the water, full of entertainment, food and drink, and plunder in the name of the good ship Geek Partnership Society! Dubloons raised in this endeavor will be used to support the mission of Geek Partnership Society, and the many fine programs it runs. Even the lowliest crew on this voyage will have access to a raffle ticket, a photo booth, and adventure on the open water. This is a 21+ event, with a minimum cost of $65 for the Crew Level, $125 for Mates (with access to a tour, cocktails, additional raffle tickets, and other perks), and $900 for Captain Level, which comes with even greater benefits. See the website for more complete details regarding the fundraising tiers.